Android 6.0 Marshmallow Six New Features, Explained In Simple Terms! Nope, it's not Meringue, Milkshake, or Mango Pie. 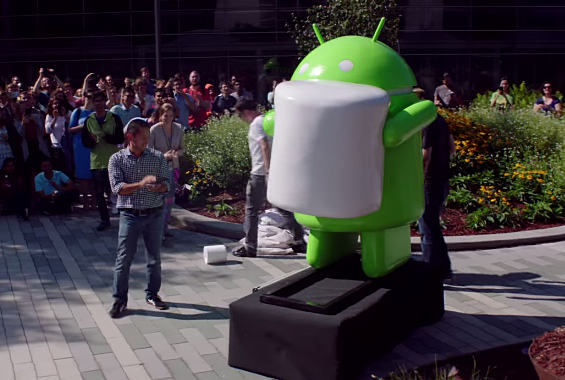 It's official: Android 6.0 M is Marshmallow. "Whether you like them straight out of the bag, roasted to a golden brown exterior with a molten center, or in fluff form, who doesn’t like marshmallows? We definitely like them!" I agree. And for what it's worth: I admit. I also love Marshmallows. Anyway, here are six key new features that vanilla Android fans and users can expect to get from the upcoming latest version of Google's operating system for smartphones and tablets. 1. Doze Mode - Some Android smartphones from Sony, Huawei, and other manufacturers already have this as part of their own UIs or skins for the OS. It basically puts the phone in deep sleep mode - with most background services disabled - when you're not using it, effectively consering energy. This should greatly improve the phone's uptime when you're finally using it. You just need to tweak settings if you still want to get Notifications and Messages in this mode. 2. Improved App Permissions - Android finally asks you if you want to 'Allow' or 'Deny' a particular app to access certain phone services when you launch it. It's very similar to how Apple's iOS handles app permissions. 3. Quicker Google Now Access - Launch Google Now anywhere you are on the phone's interface - or even while you're using third-party applications and games - simply by long pressing the Home button or saying 'Ok Google'. This is feature is no longer tied to the home screen and app drawer. 4. Android Pay, Revived! - Walk in stores and tap your Android 6.0 Marshmallow powered smartphone on the NFC terminal to make a payment. This is set to work in more than 700,000 stores in the US. Hopefully, it gets launched in the Philippines as well soon. 5. Standardized Fingerprint Support - Many Android phone manufacturers have been putting finger scanners on their devices with varying specifications and capabilities. Google intends to make this a standard feature with supporting software on all future Android phones -- starting with their new LG Nexus handset. 6. USB Type C Support - Just like the Fingerprint Sensor, Google is also looking at standardizing software support for USB Type C on future Android releases. What's cool about this port is that just like Apple's Lightning port, you no longer have to plug in a cable the right way round. It's smart and it doesn't require USB superposition. It also supports USB 3.1 standard, which transfers data and power (for charging) faster and more efficiently. So there you have it! Exciting, eh? I can't wait to play with Android 6.0 Marshmallow on my future and current Android smartphones.